Smog covering the Empire State Building. New York, NY, US, November 21, 1953, LIFE Magazine. 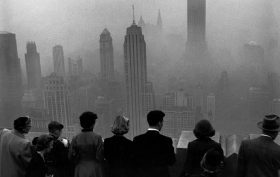 Over Thanksgiving weekend in 1966, the layer of smog that hung above New York City killed about 200 people. An estimated 300–405 people died during a two-week smog episode in 1963. In 1953, as many as 260 died from breathing the city’s air over a six-day stretch. 6sqft reported recently on Donald Trump’s proposed budget and subsequent concerns about the impact significant funding cuts to the Environmental Protection Agency totaling $2.6 billion or 31 percent–including staff reductions and program eliminations–might have on the city’s drinking water and air quality. A spokesman for Mayor de Blasio assured us that these federal cuts won’t impact NYC’s high quality water supply. But what about the air? But what about the air?